In a normal spring, we receive our yearlings from May 5th to the 20th. 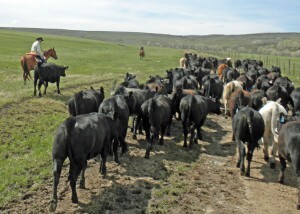 We put them in pastures on the ranch and look for health problems before they go to our forest pasture on May 25th. 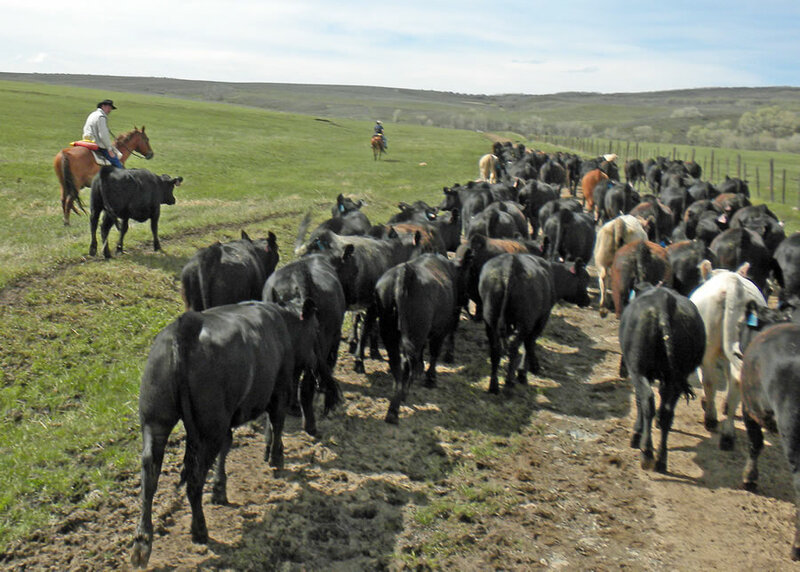 Our pasture rotation is based on a “holistic” management approach. We intensely graze each pasture 5 to 10 days then move to the next, allowing the pasture to re-grow. This means every 5 to 10 days we move 1300 head of yearlings to the next pasture, trying to clear the entire pasture within 3 days. Many of our repeat guests have become so helpful that we ask them to make a career change and hire on to the Focus outfit. Most of our guests who ride enjoy working cattle because it is fun to use a quarter horse to do that for which he was bred. However, we accommodate a wide variety of riders by adjusting the speed and length of the rides, and we instruct beginners while going to and from the cattle. Horseback riding is characterized as cross country rather than head to tail or trail riding. 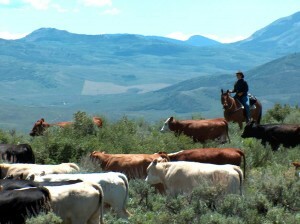 The cattle are the reason for this and also the reason our horseback riding program appeals to many riders of all ages. Depending on the ability of the rider and the work at hand, the horses walk, trot, cantor and if necessary, will do what quarter horses do best, cover a short distance quickly to keep the cattle going in the right direction. Safety of the rider comes before “getting the job done” and when working cattle, everyone is placed in a comfort zone based on ability. 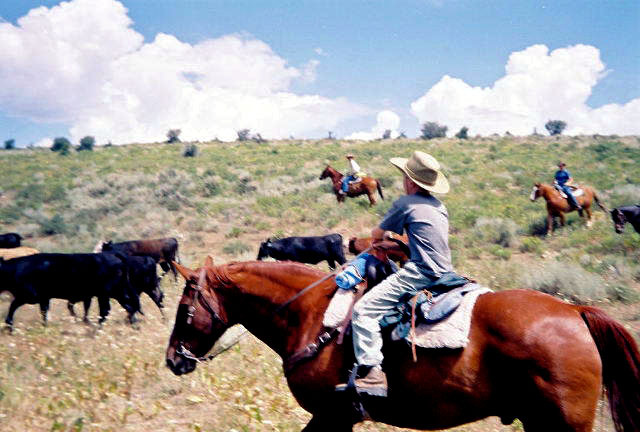 Considerations When Planning Your Visit: Riding with the yearling cattle begins in the latter part of May each year. We sell the cattle at some point during the early part of summer and typically start delivering them to the buyer around the first part of August. We ship them according to the target weight negotiated in the contract.This entails sorting them according to their size, usually ten days to two weeks before shipping. We then ship at intervals to meet the desired weight criteria. 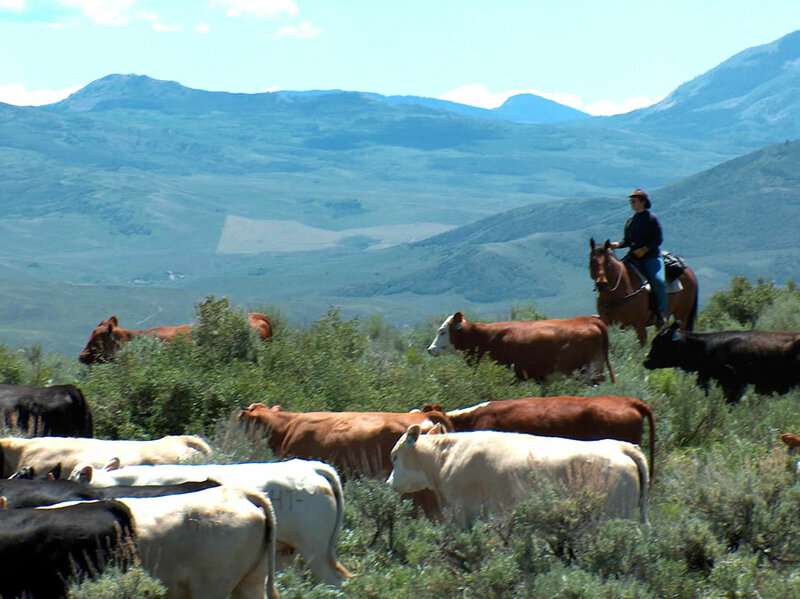 For those interested in riding when we have the greatest number of cattle, the best time to visit is between the end of May and first part of August. We have cattle year round but the greater number of yearling cattle is during this block of time. From mid-August to the end of September, the riding is a blend of cattle work, back-riding pastures looking for strays and scenic riding. Please Note: Weight limit for horseback riding is 225 lbs. Riders exceeding this limit need to inquire about riding options. There may be exceptions and we will consider these on an individual basis in advance before confirming the reservation. If in doubt, please ask.